When we discuss karma, we often focus our attention on our own individual actions – are you putting positivity or negativity out into the world? However, a select few people will carry a bigger burden, the karma of their family over generations. A buzzword that is often used throughout society today, it is said that “the law of karma teaches us that all of our thoughts, words, and actions begin a chain of cause and effect and that we will personally experience the effects of everything we cause.” In short, it’s the old saying ‘what goes around, comes around’ in action. If you put positivity out into the world, you will receive positivity in return, whereas if you are constantly spreading negative energy, you will experience negativity. While we will all experience the impact of our own individual karma, experiencing the long-term effects of our own decisions, there are those that carry a heavier burden. Karma can build up over time, and it has long been theorized that a family can carry a familial karma, the result of generations of people all interpreting their own morals and values. While this karma can come from any member of the family, there are those that will carry the burden. #1 – You sometimes experience inexplicable sickness or illness. There are times when the energy of karma weighs down upon us with such pressure that it can actually cause physical pain and suffering. This includes a sudden cold or flu bug, muscle aches or pains, unexplained headaches or simply a pressure making it difficult to breathe. #2 – You become fearful of the repercussions of bad karma. You may not realize that you’re doing it, but you will go to great lengths in order to protect yourself from the consequences of bad karma. Some may even see you as paranoid, as you focus much of your time on avoiding negativity and trying to encourage positive energy in every area of your life. #3 – You recognize that you are at a higher state of spiritual awareness than the rest of your family. 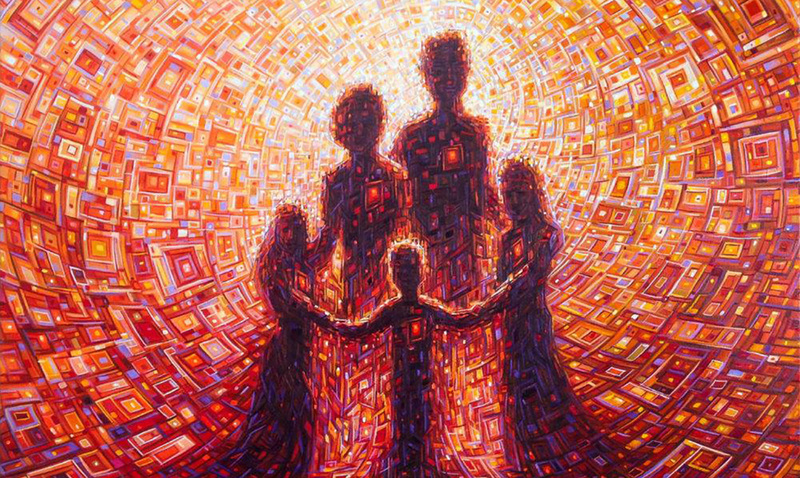 Often the family member that is responsible for taking on this family responsibility does so because they are the most connected with the spiritual realm. They can sense, feel and connect with spiritual energy in a way that no other family is capable of doing. You are more spiritually aware than anyone else in your family. #4 – You find yourself caught up in odd or bizarre family matters. When something goes wrong in your family, regardless of how weird, odd or bizarre it may be, you simply can’t avoid it. Try as you might, you are dragged into all family conflicts, disagreements, and drama. Why? As the one carrying the burden of the family karma, it’s going to ultimately impact your life. #5 – You are able to identify recurring patterns in the behavior of your family members, and you feel called to fix them. When things happen in your family, you can’t help but notice the connection with situations in your past. There are patterns and trends that exist. Family members regularly make the same mistake from situation to situation, which karma hopes to correct. Are you prepared to take this opportunity and learn from it? #6 – You don’t quite feel like you ‘belong’ in your family. It’s hard to put your finger on it, but there is something about you that doesn’t to quite fit with the rest of your family members. You feel like you are different. You may notice that you possess different character traits, strengths, weaknesses or natural responses to the outside world. #7 – You genuinely worry you may carry this karma to the next generation. This is your burden to bear; however, you also realize that someone else that comes after you will take the baton from you and continue it. For this reason, you find yourself worrying about who is going to carry the responsibility moving forward. You may even find yourself focused on fixing the current karma to relieve some of the stress from the next person.